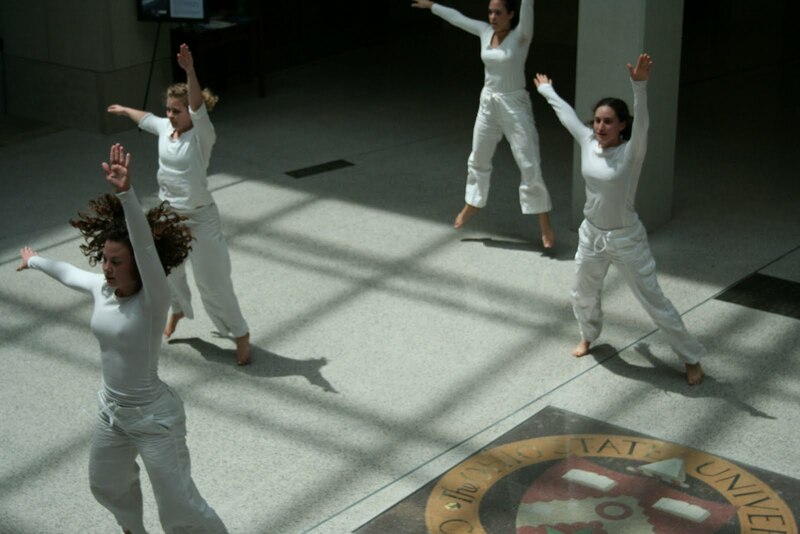 Another exhilarating dance performance I had the opportunity to experience this week was a performance of Trisha Brown’s Sololos, staged and directed by Abigail Yager, performed in Thompson Library on the campus of the Ohio State University. There is a video of the performance floating around facebook, but I can’t seem to find it this morning. I did find a video detailing the history and renovation of Thompson Library, which will at least give a sense of the architecture to which I will refer. To start, I have seen this piece three or four times, all in different settings, and I have to say that I could not conceive of a more apt space in which this piece might be performed. I am a big fan of the architecture of Thompson Library, and its structures provided a wealth of lines, spaces and formal alignments for this dance that has itself a kind of internal architecture (I think there’s a sense in which all dance has a kind of architecture, and there has been a burgeoning mass of research exploring the relationships between dance and architecture; the work with which I am the most familiar has come out of/around the Synchronous Objects project. You can read about some of this research here. I also have a brilliant colleague of mine, Mara Penrose, is currently collaborating with architecture student Renee Ripley on an upcoming project entitled Inscription, another great opportunity to examine the interplay between dance and architecture). Sololos, like much of Trisha Brown’s work, has a very precise geometry to both the movement material and the spatial organization of the dancers. There is a linearity to the movement, and a constant sense the every point on every surface of each dancers’ body both corresponds and is aware of its correspondence to spatial coordinates. In the performance of the dance, its internal geometry enters a dialogue with the geometry of the space; the coordinates of the dance become mapped onto the infinite potential axes provided by the architecture and the viewers. There is also an architecture to the timing of the dance; it goes beyond the precision of the individual actions of individual dancers and moves into the realm of interactive precision: I experience it almost as a temporal geometry, and as dancers move through various phrases of movement, in and out of unison, there is a constant sense of correlation across time. Additionally, related to both the spatial/formal and the temporal architecture of the dance, there is also an architecture to the attention required by this piece. “Sololos is one of the purest expressions of Trisha Brown’s love affair with choreographis structure. Created in 1976, it is a study of causality–cause and effect, as well as logical processes, properties, variables and facts in which dancers respond to instructions called to them from a dancer offstage. The piece begins in simple unison, quickly unravels into visual complexity, then re-ravels itself back to its beginning prompted by instructions given by the caller. Governed by strict adherence to a set of rules and requirements, it exists in endless permutation as a function of these improvised calls. The vocabulary is entirely fixed, yet the form is composed in the moment. These sets of rules and requirements are one aspect of what I am thinking of as the architecture of the dance. While the materials are meticulously set, the ways in which they work themselves out, driven primarily by the directions of the outside “Caller” (on Friday, Meredith Hurst and Mara Penrose functioned as the Callers for the dance), is improvised within those rules. Like the physical architecture of a building maintains a certain concrete fixity, a container for infinite possibilities of human movement through the structure, the movement itself is essentially improvised within these structures. Perhaps a bit more phenomenologically, I think there is something also to be said about the “fixity” or “mobility” of the architectural structures within the field of human perception. The way in which we experience a space is entirely informed by the conditions of that experience (others in the space, time of day, personal conditions, memory, etc. ), and it is in this perceptual fluctuation between fixity and mobility that I felt Sololos primarily in dialogue with Thompson Library. I had the distinct experience of the enactment of the dance re-enacting the space. A primary device of this enactment was geometrical alignment. Lines of bodies in space falling into parallelisms or perpendicularities with the formal elements of the library brought those elements into my perception in a new, previously unrecognized, way. Thompson Library is full of grids, some of which are more or less parallel (the shadows cast from the skylight, offering a grid to the floor on which they danced; the central column of the stacks, housed in grids of glass and steel which provided the backdrop for the dance; etc. ), others not so rigid (the lines embedded in the floor are sometimes curving, sometimes diagonal, offering lines off of the strict grid with which bodies might find alignment). In this sense, the revelation and transformation of the dance become a frame or device for the revelation and transformation of the library’s architecture in the field of my perception. While this could be said of any dance in any space, it was between the specific linearity of Sololos and the rich complexity of geometrical forms within Thompson Library that I felt a deep affinity, and it was through this affinity that I experienced the mobility of the space itself. Other factors contributed to this experience: I was aware of how my perception of the space transformed through the expansion and collapsing of space between the dancers’ bodies. The shifting distance between myself and each dancer functioned as a constant re-negotiation of the distance between myself and the structure surrounding us all, the space beyond the bodies. Perhaps the most overwhelming of my sensorial experiences with this dance had to do with the formulation of spatial coordinates for the bodies in space. Coordinates are defined by a point of intersecting axes. Throughout the performance of the piece, I was constantly aware of the seemingly infinite possible axes in the space. It went beyond recognizing the situation of bodies between one thing and another; I became aware of the trajectories of lines into space, lines extending as planes, the potential to consider the viewers’ gazes/attention as axes for the situation of the bodies (in constant motion). Because of the unique architecture of the atrium of the library, spectators were fully in the round (all four sides of the dance) on four separate levels. My situation was on the first floor, level with the dancers, but I was constantly aware of the viewers two, three, and four stories above the dance, and the potential to consider those gazes as the definitive axes for the coordinates of bodies. The most explosive moments for me came when bodies fell into formal alignments with one another (whether or not they were dancing the same phrase of movement): inevitably the body of a dancer would shift dramatically in my field of perception, now re-situated due to the alignment with another body onto the axes (that I had constructed perceptually) for that other body. Similar shifts occurred when bodies fell into alignments with the library’s architecture; the recognition of the alignment trumped whatever other spatial situation I had previously constructed for that body, and thus in those moments of simple reciprocity between bodies and structure my perception of the situation of those bodies (and thus the bodies themselves) became radically reconfigured. Through this process of viewing, I became increasingly aware of the constructed nature of these “axes,” “coordinates,” and “situations.” My knowledge of the “object” was entirely informed by my perception of its situation, and the qualities of that situation were arbitrarily constructed. On a more existential level, this offered some space for reflecting on the arbitrary and constructed understanding of “the nature of things.” If we (primarily) understand a thing because of its relationship to other things, it becomes important to recognize that the “other things” that we collect in order for the object to be consider is both limited and arbitrary. This is perhaps the value of intertextuality, recognizing that the meaning of a thing emerges primarily from its situation amongst others, and that by reformulating the situation of a given topic or object, we reformulate the qualities of what we know/experience it to be. The alignments of bodies with one another also affected the way in which I became aware of other bodies in space and their alignments: patrons of the library walking in unison with one another, parallel spatial pathways, oppositional spatial pathways, etc. Making my way to the arching theme of my experience, the viewing of the dance in this space began to inform me experience of the surrounding activity. Along these lines, the dance and the library’s architecture mutually redefined one another for the duration of the piece (and perhaps even after the piece, if we want to range into a discussion of something like spatial memory). A significant concern for architecture/the architect is how the structure facilitates, enables, and limits the movement of bodies in space (this might also correlate to a central concern of the choreographer). The presence of this dance occurring in the main atrium and entrance area of the first floor dramatically reformed the way in which the architecture functioned by contributing additionally limiting structures (dancing bodies) to the space. Library patrons were no longer corralled by the structure of the building, but also the disruption of the structure by the presence of a dance. The flow of human motion in the building was diverted, and in this sense, the architecture augmented. Coextensively, the function of the space contributed to the dance itself. Most overtly, one woman, engrossed in text messaging, literally wandered into the dance performance space. She appeared horrified when she recognized her intrusion, but in those moments she contributed an additional body that had to be negotiated in the dance. Besides the over intrusion, it was simple enough to consider all the moving bodies in the space as complicit in the dance. Unlike the proscenium situation in which the only obvious moving bodies are those on stage, this dance was surrounded by moving bodies, and they then entered the field of awareness in which the dance could be considered. With all of these elements contributing to the perception of both the dance and the space, it seems simple enough to assert that the Callers for the piece functioned as both choreographers and architects for Sololos and Thompson Library for the duration of the piece. The ways in which they solved the functions of the dance shaped not only the choreography but the space as well. And this is perhaps a good moment to offer a summation of the reward this expeirence provided: The experience of the dance in the space, by way of directing fresh and reciprocal attention into the space, made the architecture of the library (a space I inhabit persistently) more alive, more dynamic, and in effect more meaningful. This then might be said to be a rare opportunity that dance in non-traditional spaces (or, more specifically, familiar spaces in which dance does not usually occur): it provides a perceptual opportunity in which the space might become reinvented, revitalized, and reinvested with meaningfulness. I could write so much more about the meaningfulness of this experience: how shifting my position/perspective from one side of the dance to another between the first and second run of the piece dramatically reformed my experience; how understanding the functions of the choreography and my intimacy with the dancers/callers made an emotional landscape, going with them on a journey of problem solving, moving near-far-and near to the solution (getting all the dancers back to unison Main in reverse, I think); the moment at which one dancer, Quentin Burley, literally ended up partially in my lap because of where I was sitting and where the improvisation of the dance took him, thrusting me not only into the space of the dance, but also a heightened interpersonal awareness of the piece beyond the perceptual/formal concerns that dominated my experience; the potential metaphors for social/cultural mediation embedded in the function of the dance (if we were to allow the end unison to represent a cultural value for harmony, and consider elements like unison, deviation, minor and vast disjunctions between dancers, the range of flexibility that allows for synch-ups, etc. as informative to cultural configuration); but already being over 2000 words, I think I might have to conclude, with the acknowledgement that this dance by Trisha Brown, the superb work of Abigail Yager in its staging, the performance of the dancers and the architecture of Thompson Library, all the connections in between, offered a profound experience for my week, one about which I could write much, much more. 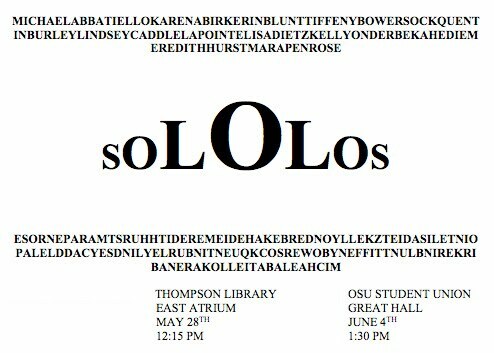 The piece is being done once more this quarter at the OSU Student Union, 4 June at 1:30. It will be different in the Union (a building I find to be vulgar on multiple levels), but I encourage you to see the piece if possible, and perhaps carry a mindfulness of its transformative potential in your viewing.